What is The Mindful Goat? Sometimes, when my husband and I joke around, what starts as a simple, silly idea eventually becomes something ludicrous and caricature. For a long time, I have bemoaned my inability to illustrate, because the ideas we have come up with over the years have endured and become ideas we reference to bring humor and connection to our relationship. Creating these mental images or cartoon characters is a ritual for us, and rituals-like holidays-are important to families all over the world. Rituals help us build connectedness through shared experience, ideas, and values. Rituals are very much steeped in our culture. 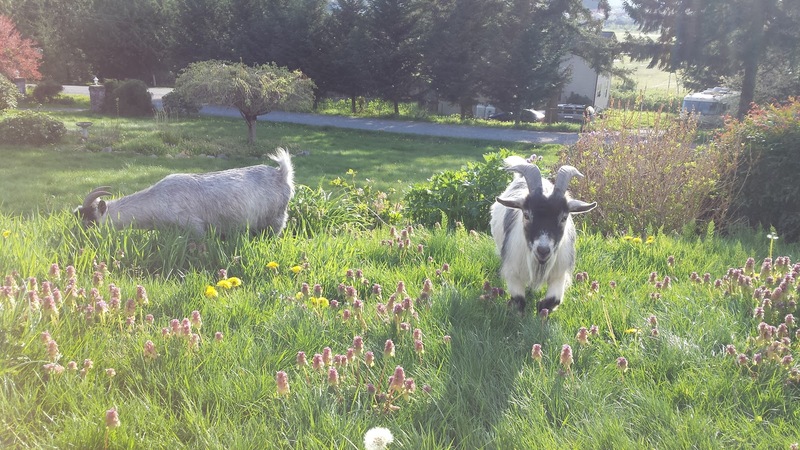 The Mindful Goat is one such example of something that started as a joke and grew into something bigger. 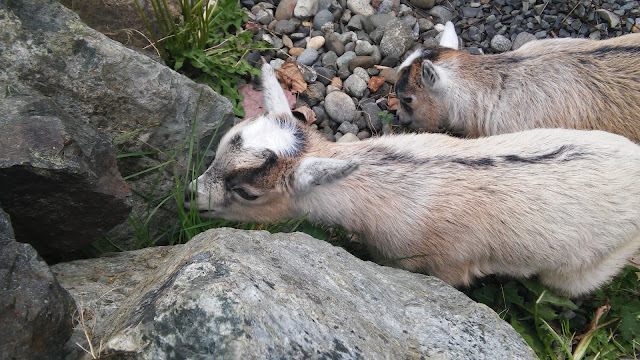 When we first bought our goats, we were in awe of how well they had been raised. We did some homework beforehand and knew that the adult goats we were bringing into our family could turn out to be lambs or hellions, metaphorically-speaking. Buck and Dove, our resident adult pygmies are both very calm and curious. They took to us quick, and we to them. One day, while watching them nibble on a particular species of blackberry bush that is invasive to our area, I was riveted by their gentle browsing habits. 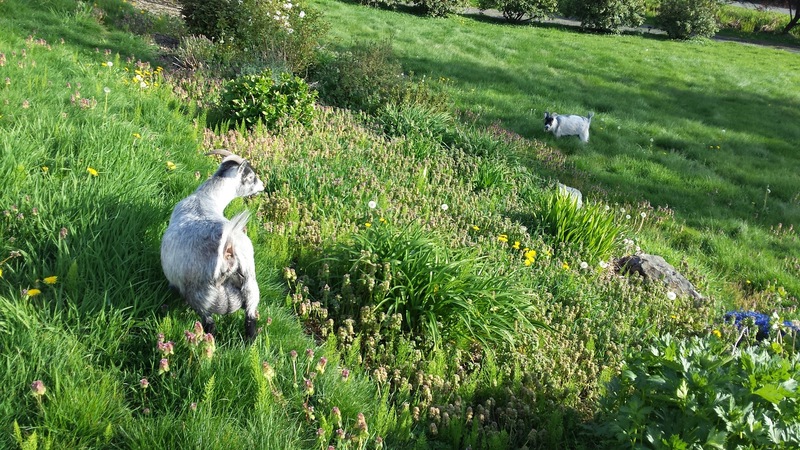 Goats are samplers. They sniff, lick, bite, chew, and rub on everything as they browse. It reminded me of the concept of beginner's mind from mindfulness. Mindfulness-Based Stress Reduction (MBSR) was developed by Jon Kabat-Zinn in the late 1970s, and it bridged the worlds between Buddhist practices and Western medicine, because it married the understanding of how the brain and body respond to stress with Eastern principles that value attentiveness and awareness. Initially, those two words may sound like the same thing (and really they are synonyms), but in the world of Buddhist practice and in clinical psychology, they mean observance of your internal and external states and presence, respectively. In a nutshell, mindfulness is about being present in-the-moment and becoming more aware of how each of those moments affects your overall well-being. In this way, the modern practice of mindfulness is inclusive of not only the traits that naturally lend toward these abilities, but the states and practices that promote this mindset, as well. The term beginner's mind comes from Zen Buddhist concept Shoshin, which is closely related to the concept of curiosity. When we animals experience curiosity, we become eager to investigate. We open ourselves to the experience before us and we contemplate the complexity or the simplicity of it. We ask questions, formulate hypotheses, and explore. A great ice-breaker for introducing the concept of beginner's mind is the Raisin Exercise. In this exercise, you close your eyes and consider a raisin that someone has given you or that you have selected. First, you explore its wrinkled texture. Is this raisin still juicy or is it hard and rigid? Next, you may smell it. You may even roll it around in your mouth before chewing it, to get a sense of the flavor and how it feels against your teeth and tongue. Most of us, when eating raisins, pop them into our mouths by the clump or by the handful. We rarely take the time to stop and explore a raisin. When The Mindful Goat was born, it was because it occurred to me that lessons in mindfulness often come from places we might never consider outside of the therapy room, classroom, or retreat. These lessons, like many others, come from the natural beauty all around us. Additionally, I like Robert Zapolsky explanation in his book, Why Zebras Don't Get Ulcers: All animals, except humans, have a means of disabling their sympathetic nervous system response-also known as the flight or fight response-once the threat has been reduced or removed. Humans, on the other hand, will worry themselves silly or sick with thoughts or memories of past real or perceived threats. In evolutionary terms, both humans and other animals have benefited from their unique autonomic responses, but humans have also been uniquely disadvantaged by the very thing that separates us from other animals-our frontal cortex, which includes the pre-frontal cortex. Without this highly evolved clump of synapses, we would be very similar to the zebras and goats who can eat a healthy lunch and not worry that they forgot to pick up their dry-cleaning for a party after work and they have no time to swing by on their lunch break because they are swamped at work. Obviously, there are a lot of things wrong with that scenario, but I think you get the picture. 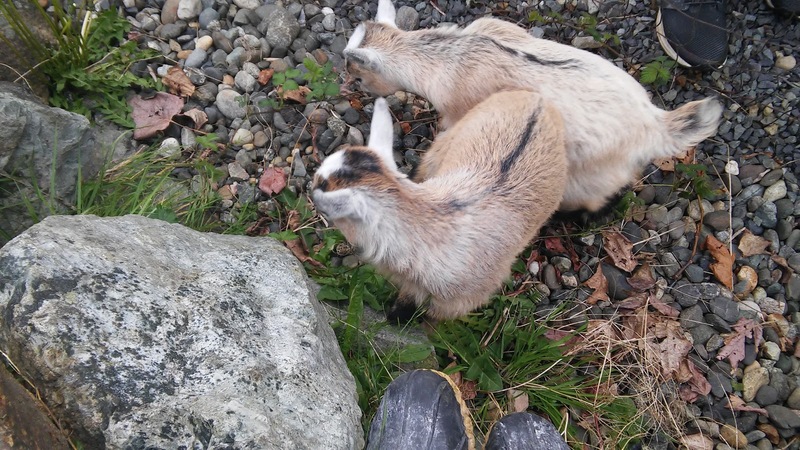 We made a conscious choice to start observing our goats-not merely watch-but really look at how they live their lives and what we as humans could glean about our own approach to mindfulness. At the very least, all of the pictures help us record our herd's lifecycle, but I am hoping this new project will become something more for us in our journeys toward helping ourselves and others transform and grow as individuals and families. If you're interested in following along with The Mindful Goat, click on the Facebook or Instagram buttons featured throughout the website, in our sidebar reel, or included in this post. If one of our posts resonates with you, comment us on social media or tag us using #themindfulgoat. You can also contact us here on our blog. Don't worry, we don't headbutt. If you want to learn more about mindfulness in general, I highly recommend Christopher Germer's book, The Mindful Path to Self-Compassion. He explains the concept and history of mindfulness very well and explains how we can apply it to all areas of our life, from improving sleep and losing weight to getting along with people you don't like and dealing with crisis. We were required to read this book in graduate school, and I can honestly say that my approach to the world has never been the same.